were awarded with a "Danish Music Award 2004" (The Danish 'Grammy'!) for their seventh album "Ovenover alting" and nominated for their 2006-album “Den niende udsigt”! Bente with her great voice and powerful singing and Leif with his very personal and sensitive way of playing make up this exciting musical combination, that sure is folk music, but in a very different way. They do their concerts in a show- and cabaret-like way. Someone once said that "It is obvious that their music is based on a high level of consciousness!" Bente: vocal & guitar. Leif: Accordion. Both: A lot of comments along the way!! After their first concert together as a duo in 1985 at the Skagen Festival in Denmark, they've since gone from strength to strength. Now with albums, cassettes and CD's, numerous concerts, radio and TV-performances, festival and folk club gigs under the belt, combined with their great rapport with the audience, they have established themselves as a well known and populare duo among the "folkies" in their home country. They do around 100-150 concerts a year. Their music has taken them to festivals and other venues in Scotland, Belgium, Faroe Islands, Greenland, Holland, Korea, Sweden, Norway, Switzerland, Poland, Malaysia and Germany. In Germany they have performed at the prestigious "Folk Fest Am Ith" which accredited them with excellent reviews. 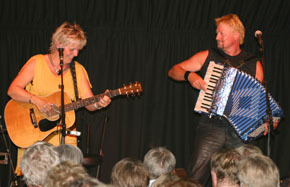 Both Bente and Leif have performed on many occasions in Scotland; Leif as a member the dance band "Danish Export", and Bente as a solo guest at The Isle of Bute International Folk Festival, The Glenfarg Folk Feast, The Edinburgh Folk Festival, The Orkney Festival and many local folk clubs and other venues the length and breadth of the country  not to mention live on BBC! And everything with great success. Their material is a blend of their own material mixed up with old Danish folksongs, other contemporary songs both in Danish and English, lively Scandinavian tunes - and a bit of Cajun, too! Eventhough when Bente sings in Danish, her audience abroad tells her that with her expression and explanations, they almost feel that they understand the Danish words anyway. And the language of the sound of Leif's accordion is ofcourse international! "Unfortunately Kathryn Tickell had to call off. However this led to a happy consequence. We got to hear a new voice: Bente Kure from Denmark. Bente has a great audience control and a smooth, natural voice." "Bente Kure filled the gap admirably!!" "As soon as we heard her we HAD to book her for the Folk Feast. Her voice blends beautifully with guitar accompaniment, and she can win over any audience with her charm and her easy manner. The quality of her performances stems from the fact that she shares with her audience the songs that she loves to sing." "It was their first time in Germany and with charm, musical skill and an engaging repertoire that they won the audience over. In the end they were even given the possibility to join in and sing along in Danish - and they did!" People gathered around for what turned out to be a wonderful evenings experience. 'Straight to the heart' was the reaction of the audience". Marvellous! Beautiful in a very moving way!" The performance is perfectly wrapped in the astounding virtuosity of Ernstsens accordion renderings of old Danish folk music." Leif Ernstsen plays the accordion in his inimitable style - the sounds some-times even defying your own ears!" In the covers of the CD's everything is written in Danish, but further down on this page you can read English explanations to all the songs. All the songs are either written by Bente Kure or translated from norwegian og english. Recorded by Bente Kure & Leif Ernstsen in 2009-2010. "It's good to see you, so good to see you. Oh how I've missed you since I've been gone. I've crossed the oceans, travelled through many lands. And it's good to see you, to be in your home." A scandinavian influenced CD. All the songs are either written by Bente Kure or translated from swedish and norwegian. A tune is composed by Leif Ernstsen and even if he composed it in Greece, it has got a very Scandinavian tone. Recorded by Bente Kure & Leif Ernstsen in 2006 and in 2007 nominated to a Danish Music Award (A Grammy!) as Folk-song Album of the year. There is a sun in everyone  you, too. Let it shine out on me. Dont listen to bad weatherforcasts  make your own good weather, because above the clouds everybody knows that the sky is blue and will always be. Its very hard nowadays to find out whats the most sensibel thing to do  all the health experts, and even worse lifestyle experts (how on earth can you be such a one!) are loading us with inferiority complexes bad conscience about what we ought to and not. Well, as long as you remember to live before you die it should be alright! Inspired by the marriage between a computer nerd and a orcanic woman  they met in a green store over a bag of carrots, and it happened at the same time as our royal prince got married to his australien Mary  so basicly its a song about getting married full of hope and believes in spite of differencies. A yong couple on the island are having their last night together in 1852 before he is sailing away on a life-long journey. After 60 years he comes back, and a young woman stands there outside the old house - just like she once did - like time has been standing still. But it hasnt; an old woman comes out, and he learnes now that he once had a son, but the sea took him, and now the old woman is introducing him to his granddaughter  and through her she has kept her love for him all these years. A lovely poem about When love has grown up and has become strong by all the troubles theyve faced together. A beautyful lovesong. A song written like a letter to a friend about feeling small, afraid of being yourself, afraid of the judgement from even your best friends  a song about letting go of inferiority complexes and just say to one another what we feel and share our thoughts without fear  and often learn that your hardest judge often is  yourself! The troll cannot speak human tounge or stand the light of the day  but watch out! Some trolls have learned to cope with the daylights and to speak human like humans. They have learned good behaviour and to say the right things in the right way at the right times. But beware  if you look closely you will still see the long sharp nails and the tail sticking out  this song is a funky political thriller!! A ballad created by the ice-flowers on the window and the pale light with a promise of better days with more light and warmth. 12 christmas songs in Danish. Half of them well known and traditional, and the rest are either translations from swedish, norwegian or english - and there's a bit of Disney too! The way the accordion is played reminds you of the organ in the church! The old Amanda (90 years old) is sitting on her own christmas evening and her only company is - a little flie that has awakend because of the heat from the candle-lights. She puts a small plate on the table with some suggar water. Remembering childhood's christmases - something in the air makes me happy inside and make me remember the good things. We are so clever at building bridges now a days. If only we could build the bridge to the land of wisdom, so that we realy could get peace on earth. Telling about how the tree is brought into our homes to remind us about that it will get green and warm again after the cold winter. A true story from worldwar one about english and german soldiers spending a christmas night together - making them think about who it actually is they're pointing their guns against. And it's also the story about that it's seldom the leaders who gives the orders that are in the battlefield! A song of christmas, peace and friendship. A very strong tradition in Denmark is to have four candle lights in a wreath of pine-branches. And four sundays before christmas we start lighting the first candle, three sundays before two candles etc. In this song there is one verse for each candle. Maria finds a little grey bird with a broken wing - she heals it and wants to give it as a gift for Jesus in the church christmas night - but she is very sad, because she thinks it's too poor a gift. But When the bird flies up to the top of the church on two healed wings and sings so beautyful as only a nightinggale can do - it becomes the most precious gift of them all. About all the lovely food and candy you get - and the stommach ache at the third day of christmas!! The tune from Disney's cartoon "Snowwhite" that is in the Disney Christmas-show that is always shown in Danish TV at the 2. day of christmas. A CD with songs written by Bente Kure, tunes composed by Leif Ernstsen and songs in Danish that Bente has translated from other languages such as english, swedish and norwegian. Recorded by Bente Kure & Leif Ernstsen in 2003 and in 2004 reciever of af Danish Music Award (A Grammy!) as Folk-song Album of the year. The songs are mostely about drawing the listeners attention towards the light and the possitive things in life, rather than the opposite. and later in their life they can always return to that expierience if their love should fade. About that very happy moment when you realize that the clouds has disapeared and you're able to enjoy life again. A crazy song in about missing the last train and then...tsk tsk! About being so happy that you're just about to take off from the ground. Feels like bubbles in your stommach. Sitting there watching the sunset over the sea and feeling the peace in your heart. And then you suddenly then gets time for a bit of everyday philosophy: You can't judge anything - it always dependes on the ear that listens and the eye that sees. Wild roses can survive most things because they are in contact with their roots! And it's the same with people! Another crazy song about love - and that love is NOT only for the youngsters! A tune named after the famous amusement park in Copenhagen. A crazy story about a worm that gets cut in two halves (and both stayes alive!) - and then it falls in love with its own tail!! 16 songs by Jeppe Aakjær (1866-1930) - one of Denmarks most famous national poets. pictures with words. His descriptions of the atmosphere of the harvest (among other things) become so alive that as you listen, his words also take you back to the experience of how it must have been in those days. With his grandiose simplicity, he described his beloved home, the moors of his childhood. But apart from being a poet, he was also a social author and a political agitator  the spokesman of the poor people in the country. 1. Prelude: Øjeblikket ('The moment' by Leif Ernstsen) combined with melodies to two famous songs of Jeppe Aakjær and followed by a song: Jeg er havren (Bells of the oat). "...I'm the song of the lark on a straw..."
(A winters evening) "...the colder the winds blows outside, the warmer the fire burns inside..."
"...a house full of poverty and debts, but with flowers and swallows all around..."
(About the stork) "...you've got wings like an eagle but a mind of peace..."
"...before you leave me, oh sunray, please kiss the flower that my beloved brought me..."
"...the light of the early dawn reflects in our spades as we march. The only banner we've got..."
(Childhood memories of the harvest of the rye) "...the dear rye was our guest of honour..."
(The story of a poor road mender's life and death) "...strange that throughout his life he worked with rocks and stones to smooth the road for others, but when he died, all they gave him was a woodden cross..."
(Written for the women that fought for the right to vote) "...too long she was the sleeping beauty, bu soon she will wake up and demand her rights..."
"...the small ponds on the moor beautyfully reflects the sunset light..."
"...and what a single rye straw whitnesed the whole field knows by now!..." "...the cow may be reflected in my shining shoes but you're reflected in my heart, my dear (!!!)..." "...I can't run wild like rivers from high mountains, but I can make the millers wheel spin..."
"...the flowers stretch up as if they wanted to by lit like a candle by the sun..."
"...my heart's trembeling in joy if only I see the morning dew on a straw..."
A CD with songs written by Bente Kure, tunes composed by Leif Ernstsen and songs in Danish that Bente has translated from other languages such as english, swedish and norwegian. Recorded by Bente Kure & Leif Ernstsen in 1998. "So when you pick that handsome flower, don't forget the thorn upon the rose - Its cut is deep and its scar lasts forever. It follows love whereever love goes." "Hold me, stay with me till morning is breaking a lover from a friend." - "Angels are in the snow, they can't escape - we know when springtime comes we'll disapear without a trace." A little black girl and her mother - refugies in the cold heart of Scandinavia - like butterflies in winterland. Yes, let's focus at your beautyful colours wich lights up in our darkness, instead of being afraid of you because you're strangers. He's always hunted by taxmen, sharks and ex-wives' soliciters. But he keeps on surviving - and he's very charming....! In the mistress' garden there's always a flowerbed ready, and there's always a mist of lies, but still the colours of the flowers are shining bright. And they're watered from the tears from her eyes. And yet it's her own choise to stay in that garden - her selfmade prison. How long will it be before you can tell me what is and what isn't? How far will you have to walk befor you can rest? Rest here now - at least for tonight. I've got a little warmth left - share it with me. It's not musc - but enough for tonight. You are as young inside as you choose yourself. Even if your body turns old it's still possible to keep your mind young. But you have to work for it - and it isn't necercerly easy. About a woman waiting for someone to take her away from that boring place she is in - and in the end realizing that she is the only one that can change her life - she shouldn't wait for someone else to do it for her! When you get depressed by the darkness of the winter - then don't blame mother nature - because the world is always turning towards the morning. Live your life now - here and now - remember that tomorrow can be too late. We may live again - but this life is the only one we've got for just now! The song comperes the song-tradition with a young, blond girl who's singing in the house of Denmark. Set sails - I'm sailing away - I'll be back some day! - but goodbye for now. A CD with songs written by Bente Kure, tunes composed by Leif Ernstsen and songs in Danish that Bente or others has translated from other languages such as english, swedish and norwegian. Recorded by Bente Kure & Leif Ernstsen in 1994. Flocks of black crows in the night, poor people being cheated, the killing of our nature, churces made of stone and not spirit. And yet I still hear the raindrops on my windows like HOPE is knocking at my door. It's good to see you, so good to see you. Oh how I've missed you since I've been gone. I've crossed the oceans, travelled through many lands. And it's good to see you, to be in your home. I haven't forgot your smiles. It's just so long ago since I've seen you so I didn't know what to say. Therefor I chose silence. About a relationship between a woman and a married man: "Please come back so I can let go of my dreams of you - because you're not right for me, but in my dreams you are - please set me free!" What is it that can make a boy turn into a beast in Hitlers uniform when he grows up? This song tries to look into that. This boy was fat, ugly and mobbed in school - mobbing of the worst kind. And now in the uniform he IS somebody and seeks revenche. A tune written by Leif Ernstsen. We think that we own nature, the world and each other. But we don't! "I'd rather have ten or more free birds in the air, than one captured in my hand - and I want you to give me everything - but only if you want to!" Judy Small wrote this song to her mother and all the other women w in the generation that lost their fathers in worldwar one, their husbands in worldwar two and their sons in Korea or Vietnam. And how they did the work of men when it was nececery, and steped back again when the men returned broken from the battlefields. Some pain in life is nececery to go through to get wiser. There's a gift hidden in all kinds of trouble - but you need not to fear darkness to get it. The old nurse working night-shifts is having her last duty before she retires - she is thinking of the good life she had as a nurse - but are also looking forward to the new life that is lying ahead. Now a days we use F.N. as an example of the gentle, soft, nice, sacreficing woman. Ths song is to tell you, that in reallity she was a strong, independed woman who took control of her own life in times where women did not do that normally - and we need to understand that about her now! When you're in pain you need someone to take over - it's so hard to communicate in and out through a wall of pain. Some moments in life you think that everything is over - but often that is just when the new, good things start to happend. It's a mixture of old folksongs and Bente's own material. Sven Norman meets the Devil and has to answer nine rare questions before he's allowed to continue his fare. And don't worry - he's a clever boy! Peder is warned by his grandmother, but even so, he set sails on his ship build of whalebones. But the ship stops in the middle of nowhere and the sailors decided to throw dizes to see who has been the greatest sinner of them all and to throw that person in the sea in order to please the sea-gods. And guess who gets the honour? "We just met and all in a sudden you say that you love me. Well, I don't hope that you overlooked that little bundle of hurt feelings in the corner, for my heart's not realy ready yet." The knight meets the 7 brothers in the wood. They threatend him because he's been messing about with their sister. He kills them all in battle, but it doesn't seem that there has been any kind of family-happines there, 'cause the maiden says "As long as you're safe, my love, I couldn't care less about my brothers!" The prince on one coast, the princess on the oposit. They want to be together and she says to him (though there were no mobile phones in these days!?! )that she will light a fire to show him the way to swim over to her coast. But an evil woman turns out the fire, and he drowns.The old fisherman gets him in his net and the princess kisses him and join him to the bottom of the sea....where we hope according to Disney, that they live happily ever after! About Kirsten who gets so attracted to the sea king that she in the end joins him in the deep, dark, wet, blue ocean - and it actually doesn't sound all that bad...hm! About how what seems to be your weekness often turns out to be your true strength - and oposit. A young girl getting pregnant, but she's not married, so when she gives birth to twins, she drowns them in the river. But her brother watched, and wants to save her soul, so he reports her to the king who convicts her to be beheaded. Her mother tries to buy her free, but then the young girl raises and shouts "Noone's ever gonna pay for me again!!" (so now we know why she got pregnant in the first place!). And then it gets very bloody. A very strong statement from the past! "There cannot grow snowberries in the field of anger, there cannot grow heather in the moor of loss, it is up to you to choose your own path to joy and happiness, you yourself are the only one who can give the right name to your nights." It's the first day of spring, so I will buy flowers and bring them to the one I love and say: "Let's forget about winter now!- Yes?" A tinker sits by the bonfire and sings about his longing to Spain where he comes from. And also sings about how tinkers are humans like anyone else. The middleaged farmer has got everything - his farm, lots of grain and lots of gold, but he also wants a wife and has fallen in love with his neighbours daughter. But she rejects him because of his crooked legs. At the end of the song he says: "How lucky you are all you men with straight legs!". And she sings: "How lucky we are all us women with long dresses!!" "Oh, isn't it a lovely summer with all the flowers - specially the roses - and talking about roses - I happend to know the most wonderful of them all - and I think about him all the time - even in my sleep!" "And in the green halls there was a bird singing like it was from my own heart - it gave sound to all my joy and pain." The young maiden prays to Madonna to make her love come back - eventhough he betrayed her and kissed another! - I wonder will we ever learn; it was like that then....and it still is! "Now we have finished the harvest, but left a bit of straw and grain for the poor and the birds - because that is right to do. And now we will celebrate!" Anna is mobbed by the whole village because of her red hair. But then the rich landlord take her for his bride (because when she's a redhead noone will take her away from him, he thinks!) and after that she's the lady of the manor, and noone teases her anymore! by Ludvig Holstein and Poul Schierbeck. About how beautyful the autumn can be with all it's bright light and strong colours.